There’s a new female superhero protecting the world — the first for Pakistan: the Burka Avenger! 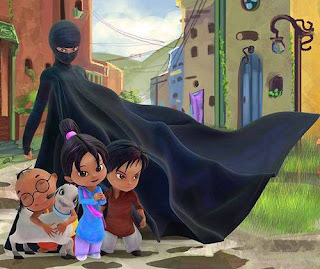 The star of an upcoming cartoon series is a teacher who uses her alter ego, the Burka Avenger, to fight bad guys trying to shut down schools and keep girls from getting an education. The show also addresses themes such as protecting the environment and not discriminating against others — all in a kid-oriented action and humor-filled cartoon. The Burka Avenger is the brainchild of Aaron Haroon Rashid, a Pakistan pop star, who wanted to create a positive role model to counter the Taliban’s ongoing opposition to girls’ education. In explaining the choice of the burka, which the teacher, Jiya, only wears in superhero mode, Rashid explained, “It’s not a sign of oppression. She is using the burka to hide her identity like other superheroes. Since she is a woman, we could have dressed her up like Catwoman or Wonder Woman, but that probably wouldn’t have worked in Pakistan."